I Joined the Navy in 1972, went to Orlando, FL for Bootcamp, Went to Radioman "A" school in Bainbridge, MD and then TELETYPE REPAIR SCHOOL. I was assigned to the USS LaSalle (AGF-3 out of Bahrain. I served there until 1974. During that time I achieved the rank of RM2 and became the ship's Cryptographer. I was also the lead Guitarist on the ship's band "THE GREENFIELDS". In September of 1974 I was transferred to the USS Dale (CG-19) out of Mayport Florida. Between my dutiy stations, I married my High Schoool sweetheart and we moved to Mayport, Florida. I spent two years on the ship making many cruises. After leaving the USS DALE, we moved to Washington DC where I served two more years at the Crystal City Communication Station. 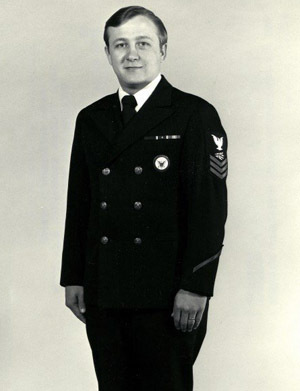 At the beginning of my tour, I was promoted to RM1 and due to the situation there (there was no senior chief or Master chief available for the billet as the PO in charge), I was assigned as the Petty Officer in charge as an E-6 and because of this position and responsibility, I was awarded NCU "Sailor of the Year" award. At the end of my two years in Washington, Dc, I was honorably discharged from the Navy and we moved back home to Cincinnati in 1978. Soon after returning home, I was hired by Procter and Gamble. I worked in the Corporate Security Division for 27 years as a Fraud Investigator-Handwriting Analyst and was fortunate enough to be able to retire at age 55. Since retiring, I have been teaching music, playing music, writing music, directing children's choir, playing in various local bands and producing music CD's. We raised a daughter and two sons and have two grandchildren. My wife and I love being "empty nesters" and spend our time taking trips to the mountains to hike,travel and see the world enjoying our time together. Retired and loving it! Finally doing my passion full time.